After seeing the lovely blooming willows at Elk Camp Shelter (see previous post), I got “willow fever”, and decided I had to go back to some of the places I’d seen large populations of the lower-growing species of Salix to see if I could finally learn to identify some of the more difficult ones. On Thursday (June 20), I headed up to Blair Lake. There was only supposed to be a 3-day break in the otherwise damp week, and I wanted to go out twice before being stuck inside again from the rain, so I took a gamble that Thursday’s forecast for a 30% chance of rain wouldn’t amount to much. On Monday, I had been up to Parish Lake Bog following a similar forecast, and the weather was gorgeous. Not so at Blair. It was tempting to turn around and leave after it started to rain within minutes of my arrival, but after 9 miles of gravel, I couldn’t be such a wimp.Thankfully, I came prepared with rain coat and rain pants, but bushwhacking through sopping wet foliage proved worse than the actual rain and eventually proved too much for my raingear. Hey, at least the sun came out for a few minutes! And I got to look at the willows that have long confused me there. I’m still not 100% sure, but I believe they are actually the same two species I saw at Elk Camp Shelter: Salix eastwoodiae and S. boothii. The former is somewhat hairy and has a slightly bluish cast from a distance, while the latter has very shiny leaves and looks much greener overall. I was surprised that at the higher elevation of Blair, the flowers were so far along, but I could still see the fuzzy capsules of Eastwood’s willow and the glabrous ones of Booth’s. 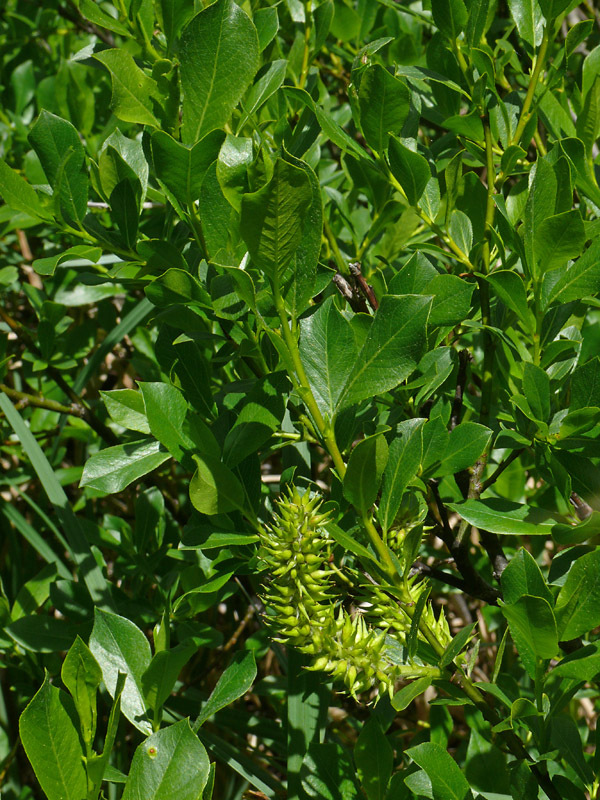 Shiny green leaves and glabrous capsules are characteristics of Booth’s willow (Salix boothii). Thursday being so wet, I was really pleased to wake up on Saturday to clear skies. Off I headed to Hills Peak to look at the willows in at least some of the many wetlands up there. I hoped that since even the lowest wetland was higher elevation than Blair Lake, I might actually get to see some fresh flowers. Unfortunately, they too were done flowering, the capsules getting much larger. Well, at least they weren’t sopping wet! Again, I’m not sure, but I think both Booth’s and Eastwood’s willows were mingled in most of the thickets. I collected a few of each for the Herbarium, so hopefully I can get confirmation from people who know a lot more about these challenging plants than I do. There were also a few of the more delicate Geyer’s willows (S. geyeriana) and many of the ubiquitous Sitka willows (S. sitchensis) with their velvety-bottomed leaves. They grew in separate thickets in the wetlands and also along the road. Having gotten the main task completed, I decided to just enjoy photographing all the much prettier flowers. While the mosquitoes were out, they weren’t bad enough to drive me out of the wetlands. 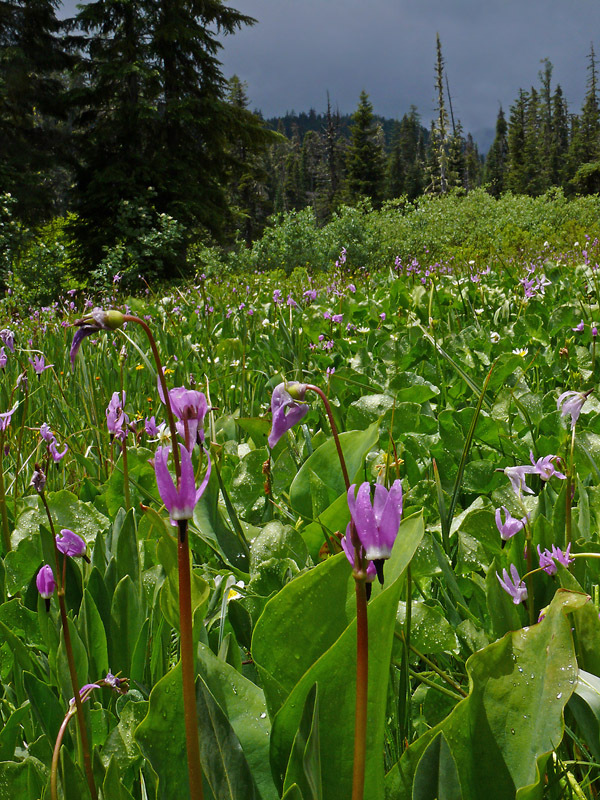 The mountain shooting star (Dodecatheon jeffreyi) was outstanding, and deeper into the wetland, the elephant’s head (Pedicularis groenlandica) had begun to bloom in earnest. Nowhere near as large but just as beautiful were masses of violets half-hidden among the sedges. Both marsh violet (Viola palustris) and Macloskey’s violet (V. macloskeyi) were in perfect bloom. Usually these are easy to distinguish, but some of the marsh violet was so pale, I wondered if they weren’t hybridizing, not that I’ve heard of that happening with violets. Quite a few of the much darker early blue violet (V. adunca) were blooming in drier areas along the edge of the wetland. 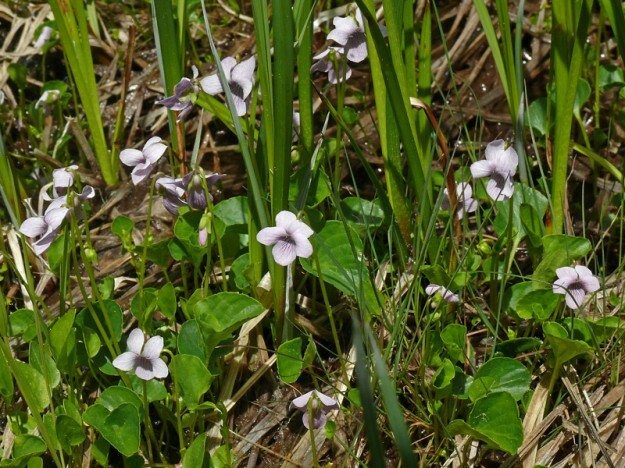 The pretty pale lavender flowers of marsh violet (Viola palustris) sit at the feet of taller sedges. After sloshing around in my rubber boots for so long, I decided to make my second stop at the cliff on the north end of Hills Peak itself. In the large flat area at the base of the talus slope, a number of rockcresses immediately caught my eye. It was the unusual species I’d been wondering about for several years, and it was blooming perfectly. Nearby, there was also a single plant of an arnica that had also puzzled me. After listening to the pikas vocalizing—and getting one brief glimpse of my first adorable pika of the year—I decided to climb up the remnant road up to cliff. It was a veritable rock garden, filled with a mix of rock-loving plants like Cascade fleabane (Erigeron cascadensis), wallflower (Erysimum sp.) and pussytoes (Antennaria racemosa and A. rosea), as well as a number of species you might not expect on a steep, rocky slope. Along with masses of beautiful bleedingheart (Dicentra formosa) werepretty clumps of tall bluebells (Mertensia paniculata) and the prickly shrubs of swamp gooseberry (Ribes lacustre) with their dangling racemes of reddish flowers. The latter two species are typically found in wetlands, but I imagine the moisture coming off the cliff and the late-melting snow that builds up here must provide enough moisture to keep them happy. Sierra arnica (Arnica nevadensis) seems more showy than many of the arnica I’ve seen. There were more of the rockcresses and arnica coming into bloom up here as well. I decided it would be useful to collect a few specimens for the Herbarium and to help with their identification. Completely ignoring the willows, my original goal for the trip, on Sunday I spent much of the day examining these specimens, attempting to key them out, and scanning and then pressing them. 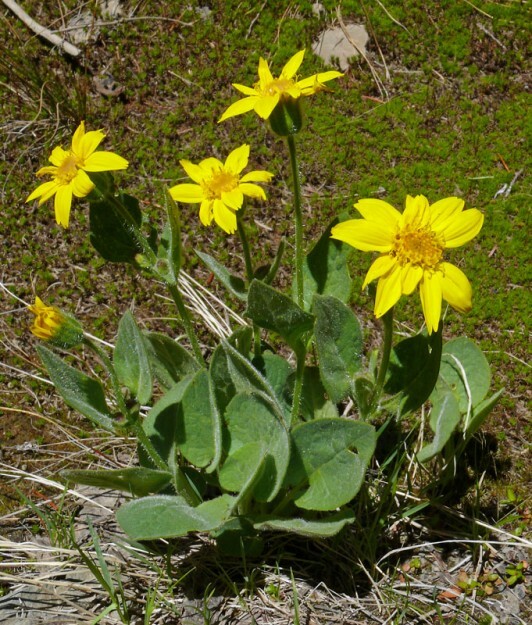 Both Arnica and Boechera are difficult genera that can be very perplexing, especially if you are not a trained botanist. To make things even harder, much reorganizing has been done to the rockcresses (formerly mostly Arabis spp. ), making many of the books out of date, and few photos or illustrations and little location data are available for the newly named species. In the paper in which the new species are described (Windham, M. D. and I. A. Al-Shehbaz. 2007b. New and noteworthy species of Boechera (Brassicaceae) III: Additional sexual diploids and apomictic hybrids. Harvard Pap. Bot. 12: 235-257. ), the authors say, “The overarching goal of this project has been to produce a usable treatment of Boechera for the Flora of North America that reflects our current understanding of relationships. Given the complex evolutionary history of the group, including rampant hybridization, polyploidy, and apomixis, this was a rather quixotic undertaking.” I’m sure even trying to understand the species in the Western Cascades will prove to be a lofty but unrealistic goal for me. Based on the leaf shape and white pappus, I’m pretty sure the arnica is Sierra arnica (Arnica nevadensis). I’ve seen this in only two other spots: Olallie Mountain and Buck Canyon. The rockcress is quite similar to the one I’ve seen on Groundhog Mountain, which Gerry Carr tentatively identified as Boechera pratincola. I’ve seen similar ones in a number of spots in the Calapooyas, but I’ve never looked at them this carefully. Many characteristics are important, including leaf shape, fruit orientation, and number of flowers, but perhaps most important seems to be the presence of hairs and whether they are branched or not. 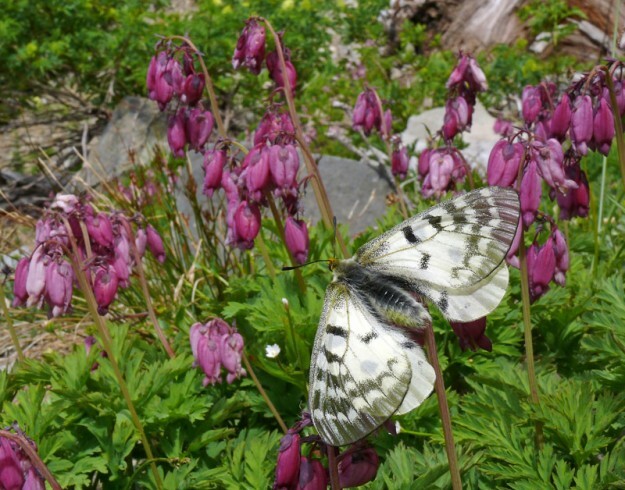 While the majority of plants in the Cascades, other than the grass-like ones, can be identified at a glance if you are familiar with the area, rockcresses make you work a little harder. Out of laziness, I’ve neglected them for too long, but I guess it is time make some effort with these pretty if not usually showy plants. Photographing this beautiful parnassian kept me busy for quite some time. I thought he was freshly hatched because he kept climbing up plants without flying. Sadly, it turned out one of his wings had a break in it, preventing him from getting aloft. Bleeding heart is the host food plant for the clodius parnassian, a good reason there were several others flying nearby. 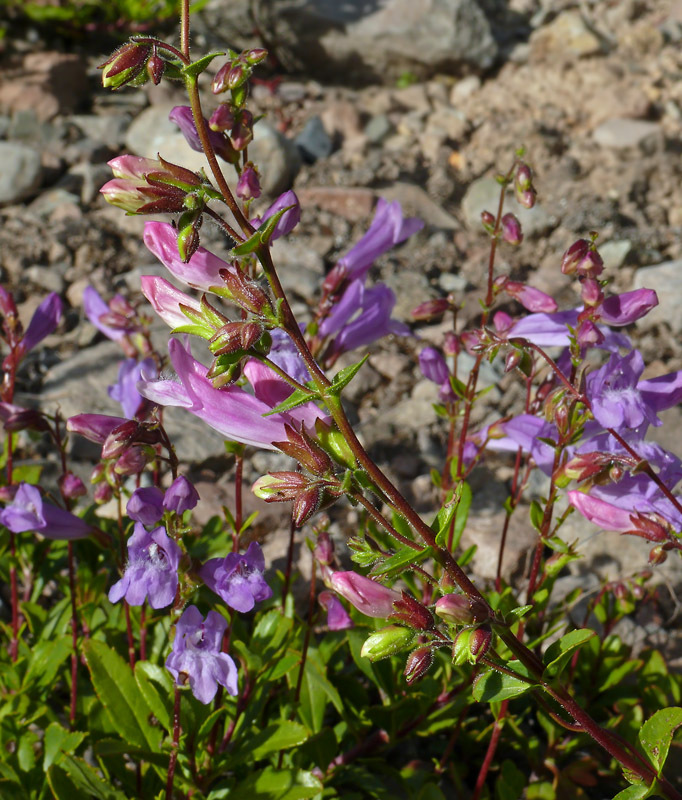 Several pink-flowered plants were coming into bloom in a large population of Cardwell’s penstemon (Penstemon cardwellii) along the roadside, possibly evidence of some hybridizing with cliff penstemon (P. rupicola). After spending so much time up near the cliff, I only had time for one more stop, so I just drove up the road a little ways to the small lake right off the road. The wetland here was also very pretty with shooting stars and elephant’s head. Only the shiny green Salix boothii seemed to grow here, but again the flowers were finished blooming. But there were fresh flowers on the other early-blooming shrubs, including alpine laurel (Kalmia microphylla), bluefly honeysuckle (Lonicera caerulea), and several species of huckleberries (Vaccinium scoparium, V. membranaceum, and V. uliginosum). Violets were blooming, as well as the delicate, creeping Gorman’s buttercup (Ranunculus gormanii). A herd of elk had obviously been here recently. Their giant hooves had torn up some of the vegetation, and large areas were completely matted down. As I walked by these spots where they had bedded down, their overpowering scent assaulted my nose. I love connecting to wildlife, and seeing elk is always a big thrill, but this smell is really, really unpleasant. Between that, the clouds building up, and the mosquitoes becoming more active, I decided it was time to head back. That still left me time for some very pleasant roadside stops on the way back: for beautiful rhododendrons, a floriferous mixed population of purple and pink Cardwell’s penstemon (P. cardwellii), a bank of yellow Nevada deervetch (Lotus nevadensis), and fragrant mockorange (Philadelphus lewisii). Definitely a day well spent!